Yo-Yo Ma was born on October 7, 1955 in Paris, France. Although he born in France his parents are Chinese. His interest for the cello begin very early in his life at age of 4 years old, since his father was his first teacher. Later on they move to New York City where he was exposed to a more liberal, free art education studying at The Juilliard School, located in the Lincoln Center for the Performing Arts in New York City, is a performing arts conservatory. Aiming to master his conservatory training, he graduate from Harvard University in 1976. 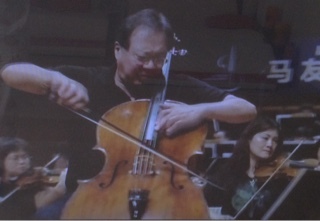 Yo-Yo Ma has recorded more than 90 albums witch more than 17 albums received the Grammys. His music stayed on the Billboard chart on top 15 for consecutive times maintaining a stable remark. He has received the Avery Fisher Prize in 1978, the Glenn Gould Prize in1999, the National Medal of the Arts in 2001. In the year 2002 he was appointed by the United States Department of State a Culture a Culture Connect Ambassador. He also received the Dan David Prize and the Sonning Prize in 2006, the World Economic Forum’s Crystal Award in 2008, the Presidential Medal of Freedom in 2010. In the year 2011 Yo-Yo Ma was was recognized as a Kennedy Center Honoree, received the Polar Music Prize In 2012 and the Vilcek Prize in Contemporary Music in 2013. He performed at the 56th Inaugural Ceremony by invitation of President Barack Obama. His passion for music led him to start in 1998 a nonprofit organization called "Silkroad" adding a new approach to culture, art and education, it's divine! In addition to that "Silkroad" associated with Harvard University bringing the organization to the next level in education, business, arts, culture. Yo-Yo Ma insatiable commitment to educational music put him in collaboration of Maestro Ricardo Muti intending to guide and influence the artistic forms of The Negaunee Music Institute of the Chicago Symphony Orchestra, and for Chicago Symphony. Yo-Yo Ma interpretation performance of Shaker Elder Joseph Brackett "Simple Gifts" of the 20 Century is really a gift to our generation and the generations to come. "Simple Gifts" have become one of the most popular American Folk religious song. Joseph Brackett was born in Cumberland, Maine, in 6 May 1797. He is one of the most prominent composers in the United States although he did not compose too many songs because of his involvement with church minister. Yo-Yo Ma is pure music, his influence to our society is definitely given by his free spirit and his persuasion in connecting one another to the artistic world is a Plus!